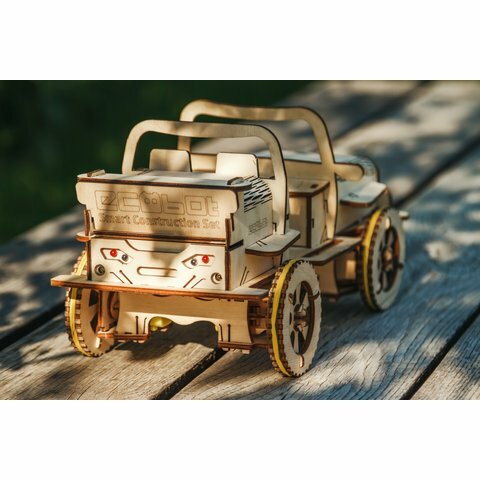 Bluetooth controlled EcoBot Buggy is a wooden construction kit for individual assembly of a robotic vehicle that can be easily controlled via your Android-based gadget. Download special free of charge application EcoBot on your smartphone or tablet and give your car a test-drive! The device is Bluetooth controlled. 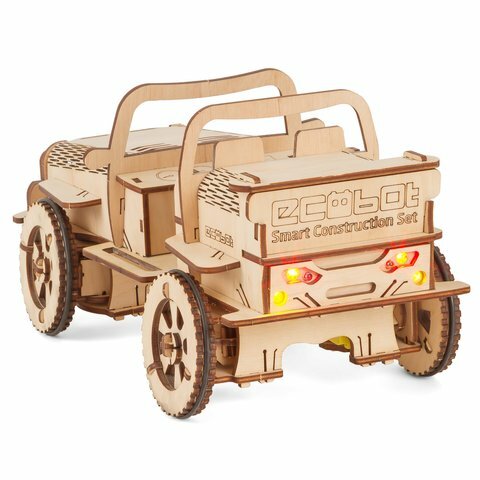 This electronic robotic kit can be used to learn the vehicle structure and the basics of robotics. 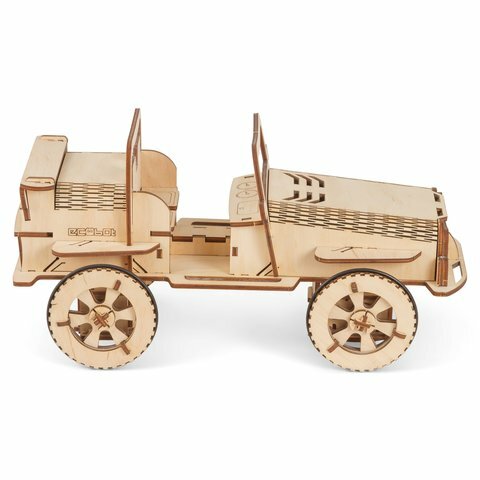 A cool gift that will bring fun and joy both to children and adults. 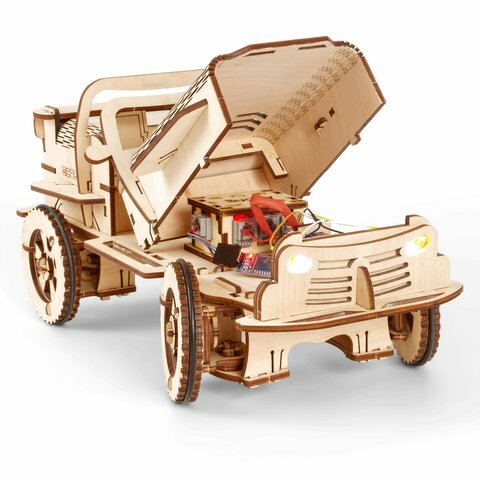 Great combination of a 3D wooden model and electronic elements. 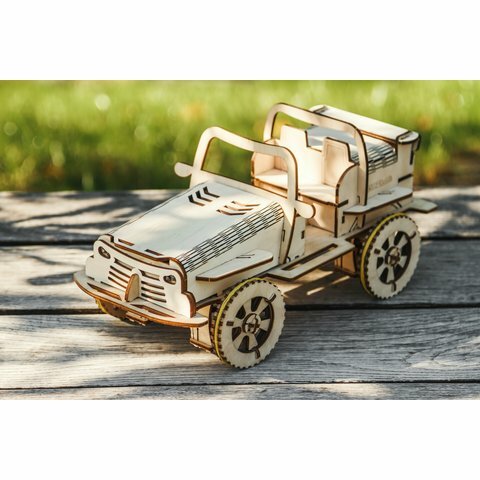 First you need to assemble a car body from wooden parts (the parts are ready-made and can be simply removed from the board) and then attach all necessary boards. 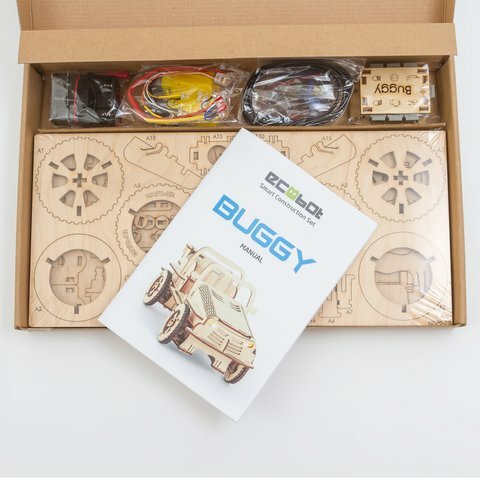 All electronic parts are preassembled and ready for use, no wiring or soldering required. 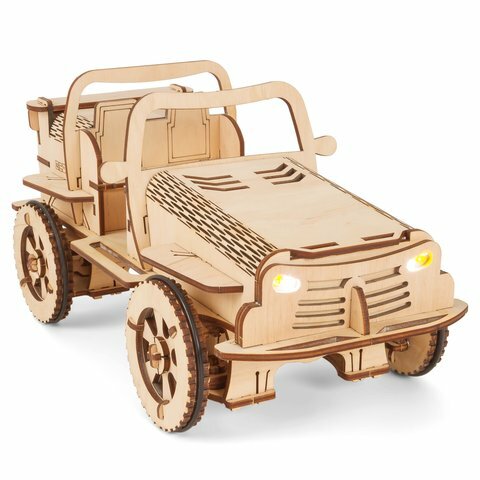 The car can run forward and backward, turn right and left, turn on and off head or rear lights. In addition, you can turn on the alarm and even honk the horn. The set includes a detailed illustrated user guide. 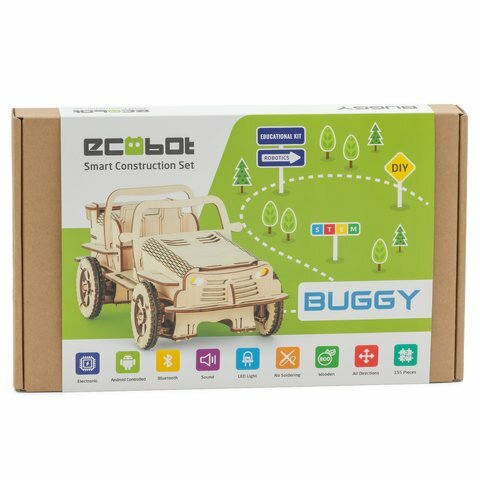 The device is Bluetooth controlled from Android devices only. Learn the operation concepts of basic electronic devices and basics of car structure. 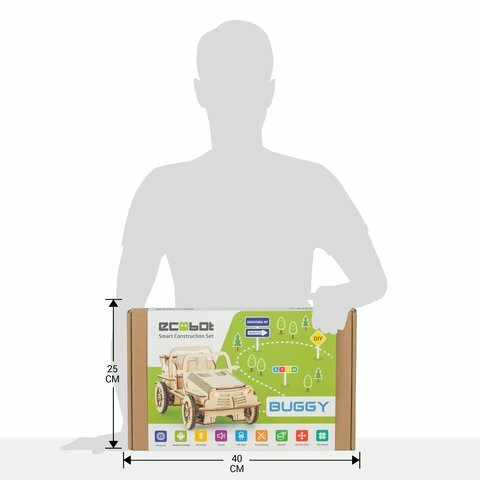 Illustrated and detailed user guide included in the kit. Control board (analogue of Arduino Pro Mini) – 1 pc. Engine control board – 1 pc. 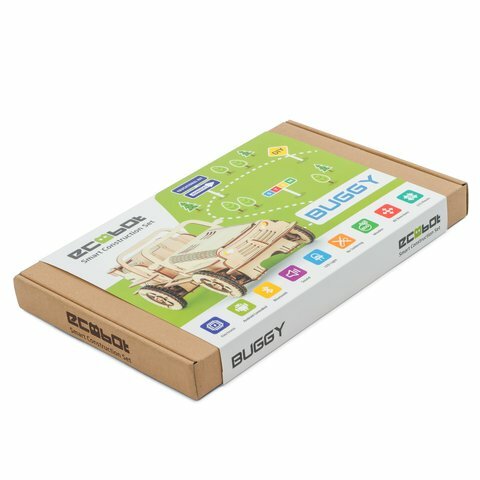 Bluetooth module – 1 pc. Rear light – 1 pc. Head light – 1 pc. 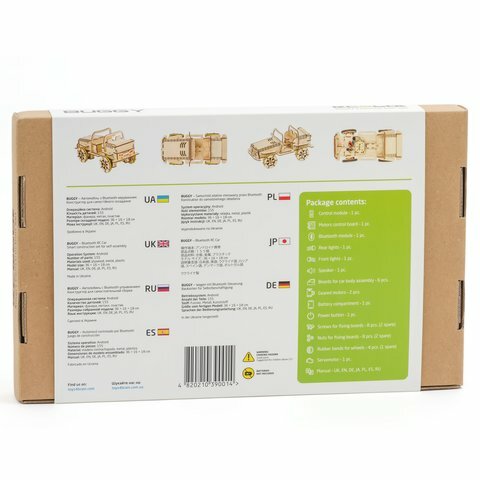 Boards with wooden parts – 6 pcs. Geared motors – 2 pcs. Battery slot – 1 pc. Power button – 1 pc.